Plant a new pattern of climbing vines for tableware sure to make multihued daydreams bloom, no matter what you're serving up. 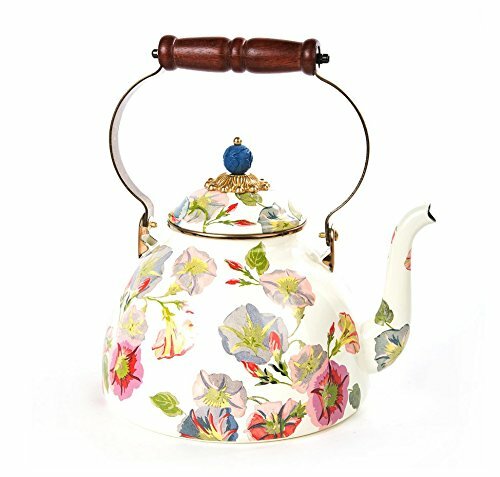 Our 3 Quart Morning Glory Tea Kettle is crafted of sturdy yet sophisticated enamelware and bedecked with a pattern of rise-and-shine vines. A delightful way to start the day with a fresh cup or brighten your afternoon at teatime. Heavy-gauge, hand-glazed steel underbody with hand-applied transfer decoration,rimmed in bronzed stainless steel. Antiqued brass finish zinc and wood handle;brass, and faux cinnabar accents. Pieces may vary due to the handmade nature of each product. Do not use on induction cooktops. Hand-wash with mild soap and dry immediately.